On this episode of WHM Interview, the gang sits down to chat with the legendary Gilbert Gottfried! Just as we'd hoped, our talk jumped all over the place, hitting such topics as Adolf Hitler, The Twilight Zone, some of Gilbert's early impression bits, the Universal Monster films, our mutual disapproval of The Jackie Gleason Show, and, of course, several of Gilbert's hilarious appearances in film and television, including: the Problem Child movies, Beverly Hills Cop II, Highway to Hell and the live action Superboy show! Much thanks to Gilbert for coming on and being so friggin' funny. 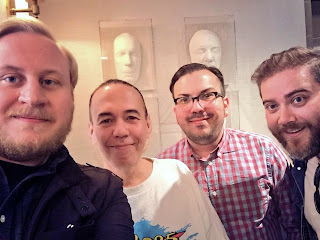 Be sure to check out Gilbert Gottfried's Amazing Colossal Podcast on gilbertgottfried.com, iTunes and the Sideshow Network - sideshownetwork.tv! Great interview, guys! Gilbert is a hilarious comedian with one of the best laughs in the business. I wish you did another interview with him...while watching Cocoon. Loved the interview! You guys do a great job handling guests and I hope there will be more interviews in the future. I'd love to hear an interview with Kevin Pollack, who has a pretty great podcast on Earwolf. I doubt that's gonna happen though, after your 'House Arrest' show. Thank the heavens Gilbert Godfrey tend his voice down,cause his public persona is, how you say, unlistenable. This was a good interview. I spent my puberty years anxiously awaiting the next bikini movie USA's 'Up All Night' would play.